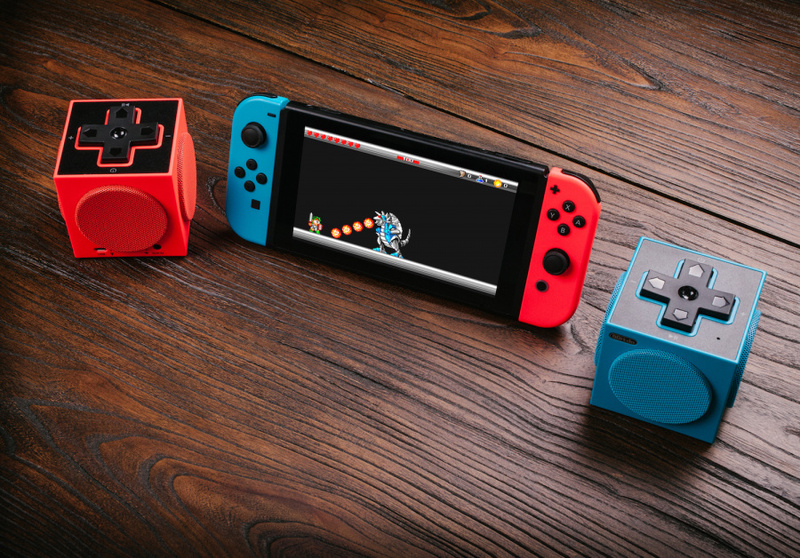 Accessory maker 8Bitdo has unveiled three new products at E3 this year, primarily aimed at Switch gamers. First up is the SNES30 Pro, which is billed as "the ultimate retro gaming controller." It showcases bluetooth, USB-C, rumble vibration, motion controls and player indicator LED’s, and is expected later this year. In short, it's the ideal retro-themed replacement for your Pro Controller. The company also has the NES30 Arcade Stick on the way. This wireless controller will be perfect for Ultra Street Fighter II, and boasts turbo functionality and joystick / D-Pad modes. You can expect to see this in Q3 this year. Finally, we have the TwinCube Stereo Speakers, which come with wireless bluetooth, stereo speakers and AUX input - the final point being key as the Switch doesn't support Bluetooth audio. These are also coming in Q3 this year. 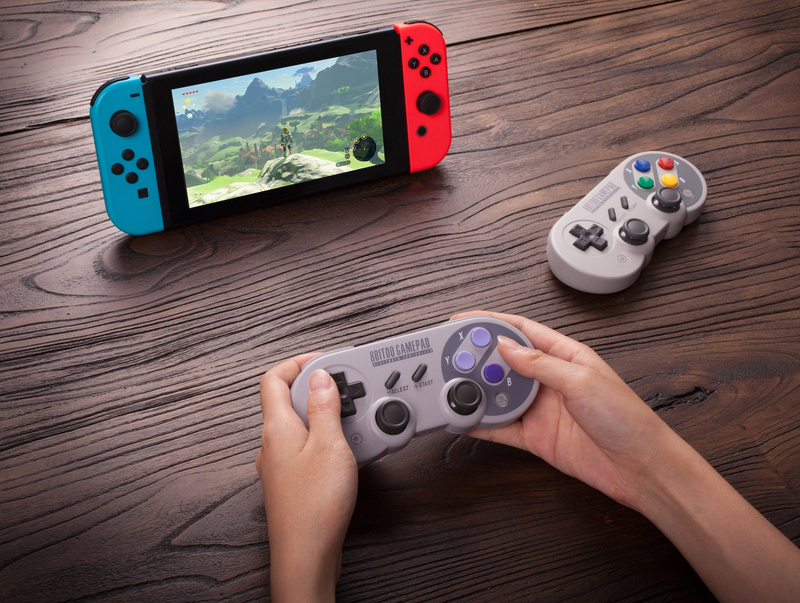 We've big fans of 8Bitdo's controllers here at Nintendo Life - many of which were recently updated to work with Switch - and we'll be reviewing these products as soon as we can get our hands on them. Will you be investing when they launch? Think I prefer their NES30 Pro controllers but the arcade stick will be mine. I havee both the US and EU/AUS SNES30 controllers, they are simply the best. I also have their NES and SNES retro receivers. Was playing MK8 Deluxe on the weekend with the snes controller thinking... I wish it had control sticks... checked theirr website, nothing new yet... and them wham today good news! Great company and excellent products, great work 8bitdo. Price point will be interesting. I never understood why Nintendo themselves havn't jumped on this bandwagon. I'd love to buy official crafted imitation controllers to play VC games (when the eventually announce it) with. I really want the retro experience as authentic as possible, but with the conveniences of modern gaming! Drool. I have the NES30 Pro and the original 8bit NES speaker and both are great. Agree about Nintendo missing opportunity here; glad 8bit is picking up the slack. My current SNES30 works beautifully with the system. I'll keep an eye on these new controllers. Does this mean the FC arcade stick will FINALLY get an update? Nothing since Jan 2016. I think I'll skip the Snes with sticks controller for now. Looks cool and all but I think I would had just prefer my SNES30 without the analog sticks. Already got the NES30 joypad so I'll probably skipped this as well but it's nice that they give us more options. Now c'mon 8Bitdo when will we get a Sega Genesis version of these things? I really want to play Mira, Sadira, Hisako, Rash, and Kilgore in Killer Instinct using a true wireless Sega Genesis controller (instead of the Super NES controller) please. I really like the SNES styled controllers. I posted them in the forums yesterday. If the performance is good I can see myself picking one up in the future. I like 8bitdo's stuff I just wish it wasn't so hard to get a hold of here in the US. 8Bitdo shut up and take my money! I need that arcade stick in my life. Holy poo that is gorgeous. 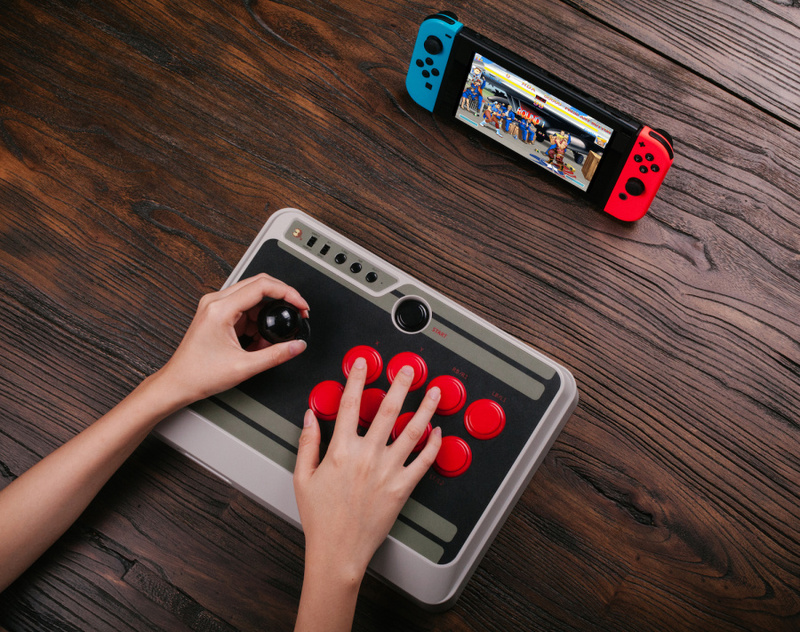 Does anyone know how their arcade stick would compare with the Hori RAP in terms of arcade accurate controls? I LOOOVE the wirelesness of this (I hate the wired idea on the RAP) given that Switch is Switch. But if it's not the real solid arcade controls, it kind of defeats the point. WHOA!!! These look great, especially the arcade stick. I got the NES, SNES and NES pro joysticks they make and they are top notch. Especially for the price...so I'm all aboard this train. That NES30 Arcade Stick has a date with all of Hamster's ACA archives! @Shiryu My thoughts exactly, this is perfect for all arcade style games. I also think this would be good with Puyo Puyo Tetris and Super Bomberman R.
@Drache_Kaiser Perfect for "Tekken 7" and "Dragon Ball Fighters Z" when both games are finally announced for Switch too! Love my NES30 Pro, so I'll definitely grab the SNES30 Pro too. @Drache_Kaiser I haven't bought any additional controllers for the Switch, have just been using the Joy-Cons that it came with. I updated the NES30 Pro precisely for that purpose - both Super Bomberman R and Puyo Puyo Tetris. What a difference. So worth it. I already had the NES30 Pro, so it felt even better not to have to dish out $100CDN for an official Pro controller. And of course they had to announce this gem when I had finally just bought a Famicom-colored 8bitdo. @Ryu_Niiyama You're the resident arcade stick enthusiast....do you have any knowledge of 8bitdo arcade sticks and how they measure up to Hori? I did some quick searching and found they made a Famicom themed one for Android/iOS/PC a while back (discontinued) that used Sanwa parts, so it sounds like they MAY be decent? I have my RAP on preorder (finally!) but the wired connection thing still seems greatly conflicted with Switch's nature. This one is wireless......if it's of similar build it could be a lot more ideal for Switch. @NEStalgia I know nothing about 8bitdo, sorry. Never heard them bandied around on forums either. I doubt they are using any arcade grade parts for this particular stick (sanwa or seimitsu or even HAPP for that matter) so I would personally consider this a casual stick. I would have to look into their listing (I've ignored them honestly) to see if they are using sanwa this time around. They are passable if you don't devote a ton of hours to it but sticks like this tend to fall apart under regular use. Wired is preferred for fighting games so I'm not bothered by the the Wired HRAP but I have seen people do alright with wireless...they usually cannibalize a 1st party controller...I haven't seen enough padhacking details on the joycons or pro controller yet to suggest that (and I'm not sacrificing a controller to test lolol; not made of money over here!) but I am keeping my ear to the ground because I'll be making a wireless stick sometime this year for toting reasons. Congrats on the HRAP order! I placed mine the day Amazon posted the listing...can't wait! @Ryu_Niiyama Thanks. Yeah I didn't know if they had a known good history or not...sounds like I'll stick with the HRAP. There's actually a fair chance it will use Sanwa since their old mobile/PC one says it did and looks like the same form factor (in a Famicom skin instead of NES skin), but no guarantees, and I can't tell if that one used only a Sanwa stick, Sanwa buttons, or both....so it's too much a wild card might be great, but more likely it's not as cool as the HRAP. And for me, competitive fighting isn't the point. The FEEL is the point. That beautiful arcade feel. I'm really just a casual stick user (by far) but I know what the real deal should feel like! I can't imagine ever managing to solder a joycon into the thing....not much of a padhacker myself. I'm Hoping Hori comes out with some kind of "wireless USB dongle" for connecting it if it sells well. (They'll probably just sell a different model instead ). Your idea of a Switch docked to an HRAP is too awesome a "genuine home arcade cabinet" to stop dreaming about!